Walt Disney had a few successes with making films abroad, mostly in the U.K. Most likely due to the large amount of traveling he did in Europe, he decided to test out another location. His inspiration this time came from the Vienna Boys Choir in Austria. The source material was an unpublished story by German author Robert A. Stammie about a boy who desperately wanted to be part of the choir. The screenplay was adapapted by Vernon Harris. While this was his only Disney film, his most famous screenplay was for Columbia Picture's Oliver in 1968. Filming took place entirely in Austria. Being an international film, there aren't many familiar Disney faces. Vincent Winter who plays Tommy had a small role in Greyfriars Bobby and later appeared in The Three Lives of Thomasina. Sean Scully, who plays Peter, also made a TV movie for Disney that same year that was an adaptation ofThe Prince and the Pauper. Director Steve Previn had a career directing for television. This was his only Disney film, although he directed several made for TV Disney movies. The film begins with footage of Austrian landscapes as the credits roll. When a train rolls in returning the Vienna Boys Choir from a tour, the conductor's son Tony decides he wants to be a singer. His mother takes him to audition and he gets in for a probationary period, but his father doesn't want him to do it. His dad changes his mind once he sees the amazing school Tony will attend as part of the choir. A boy named Peter is in charge of getting Tony acclimated, but rivalry starts to form between them when the director notices that Peter's voice is starting to change and takes an interest in Tony's soprano voice. Peter attempts to get Tony in trouble for having a contraband radio, but instead his probation is extended and he is made a full choir boy. When Peter's solo is given to Tony, he tries to lock him in a room to prevent him from performing. Tony sneaks out the window and hugs the ledge to get into the room to perform. Tony doesn't tell on Peter, who overcomes his jealousy and helps him with his songs. Peter's voice changes so much that he can't perform anymore. Tony wants to make sure he comes on the tour, so they have another boy sing for Peter backstage. But Peter realizes the conductor knows something is amiss and runs offstage during the performance. In the end, the conductor takes Peter on tour as his conducting apprentice. 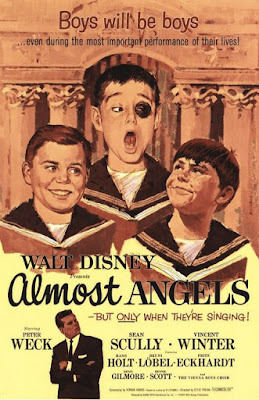 Almost Angels was released on September 26th, 1962 as a double feature with a rerelease of Lady and the Tramp. The marketing angle was "Mischievous Dogs and Mischievous Boys!" Critics gave it great reviews, praising its cute story and great songs. It did well at the box office primarily because of the animated classic it was paired with. However, audiences must have enjoyed it because Walt was convinced that he should make more films abroad. Internationally, it was known as Born to Sing. It had its first TV airing in 1965 and made its home video debut in 1986. There is much to love about Almost Angels. The lush landscapes and historic filming locations in Austria make it feel authentic, and the use of the real Vienna Boys Choir certainly adds to this. As someone who grew up as a choir boy, I relate to many of the conflicts in this film. It also does a good job of showing that there is nothing girly about boys being in a choir (except for the scenes where the boys dress like girls for a performance). The classical music is a delight as well. On the whole, its a delightful picture that certainly deserves a bigger following. It would be great if the same audience that has recently been captivated by High School Musical and Glee could take an interest in this film about one of the most historical choirs in the world. Almost Angels is currently available on DVD as a Disney Movie Club Exclusive. Disney made a mistake when producing this DVD and put the PAL version instead of the NTSC version on the disc, meaning it runs faster than it should. This is most noticeable during panning shots. The film is also presented in fullscreen, when its theatrical aspect ratio was widescreen 1.75:1. It has no bonus features.